The Nezinscot was originally constructed by Neafie and Levy in 1897 as the DeWitt C. Ivans for Moran and Company. She was purchased for $30,000 by the United States Navy on March 25, 1898. 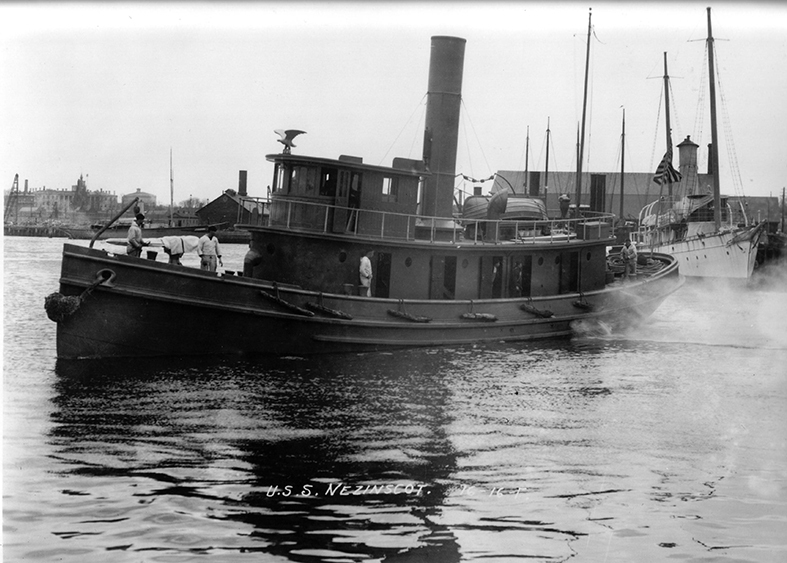 The 85-foot iron-hulled tug was commissioned on April 2, 1898 and operated out of Key West, FL serving in the North Atlantic Fleet during the Spanish American War. Beginning in 1901, the Nezinscot operated out of Portsmouth, NH running between ports in New York, Massachusetts and Maine. While steaming from Portsmouth to Boston carrying a cargo of chains, anchors and search light equipment for the USS Missouri, the Nezinscot capsized and sank when a deck load shifted in heavy seas off Cape Ann on August 11, 1909. Of the nine person crew, there were four fatalities. A research team aboard the dive vessel, GAUNTLET, led by Captain Heather Knowles and Captain David Caldwell located the wreck and conducted survey diving operations at the wreck site beginning in July 2007. Dive teams accomplished photographic and physical documentation of the wreck. The team, among the first to see the Nezinscot in 98 years, included Captain Eric Takakjian, Peter Piemonte, Scott Tomlinson, Pat Beauregard, Brian Holmes, Steve Pace, Tim Dwyer, Roman Ptashka, and Jeff Downing.